Rubber earring backs hold wire earrings in place. Set comes with 12 earring clutches. Just use as erring backs. these wire earring clutches were a great price and exactly what you see in the store (if you can find them at all). would definitely order again if needed. NO matter the occasion or the price of your cherished earrings - say goodbye to the worry of those darn backings that somehow slide-off along your with glitz, glamour & memories. Mine was an irreplaceable heirloom; the worst kind of loss. From what I gather, it's happened to most ladies too many times. Actually, I stopped wearing my pieces of jewel earrings, especially precious stones or diamonds, for fear one will fall out. Yet, the reason we bought or were gifted these beautiful earrings were to show-off and not stow-away in it's box out of worrry. NO wonder why people choose to shop for gold or platnium with CZ's or Diamonique! too much risk for thost precious stones to fall out. One glorious day, I came upon these types of backings. OMGosh, the answer to our problems - literally! Best discovery, it will save much heartache and $$$ for pennies on the dollar. I wouldn't hesitate ladies, well worth the price. Don't risk don't your precious gem stones or simple pearls to crumbly backings that should twist and hold BUT DON'T. I learned the hard way, and the worst part is retailers don't hesitate to sell fancy earrings with twist backs for sercurity but when those backs fail... I havne't seen one company yet step up to the plate and acknolwedge failure on their end. The consumer is just out of luck. SHOCKING, ISN'T IT. GO FOR IT, you won't regret it! For those who say the hole is too small: I do a "practice run" and insert the wire into the hole before I put the earring on. It opens the hole a bit and makes it easier to use. If they were larger, they would be unsightly in the ears, in my opinion, but yes, I have lost a few. Still better to lose a back than a favorite earring. I use this item to keep from loosing my pierecd earrings! It was what I expected, thanks. don't have to worry about losing my earrings! With most pairs of earrings to assure they do not fall out of lobe. So far these clutches have worked on all the earrings I have tried them on. They slid on easily--not too tight, not too loose. The only problem I see with them is that because they are clear and so small, they get lost easily and you cannot find them. I actually dropped one taking it out of the package immediately after I received this order and have yet to find it, so I am already out of one set. Other than that, they are a great little product that prevents you from losing earrings that may slide out of your ears. I have been constantly losing my earrings if they do not tie - these are invaluable for saving valuable earrings! If you're tired of your earrings with french wire hooks coming out of your ears, then you'll love these cluthes. I'm delighted with this product. Glad to know that I will not loose my earrings. First Time Shopper at Miles Kimball. This was my first shopping experience with Miles Kimball and: 1.) I was very pleased with the quality of the merchandise purchased and, 2.) I certainly will purchase more merchandise from this Company. Everything about the entire mail order procedure was exact and quick. Yes, indeed, I would recommend to my family, friends and anyone else to carefully study the Miles Kimball catalog and know that what you want to purchase will be high quality, low priced, quick and convenient. Now I don't have to worry about losing an earring. These keep them secure. I'd lost more french hook earrings than I care to count before I discovered these. I lose these, too, but it's a lot better to lose a little earring back than an earring you loved. Don't leave home without them! Too bad I had to lose a favorite earring before I bought these. Easy to use, comfortable, don't show behind earlobe. THESE EARRING BACKS ARE GREAT FOR FRENCH WIRE EARRINGS THAT YOU WANT TO KEEP SECURE..I ALSO USE THEM IN PLACE OF BACKS FOR POST EARRINGS..A GREAT VALUE AND I FEEL MY EARRINGS ARE VERY SECURE WHEN I HAVE THESE ON. Instead of using them as described, I ordered these to replace the butterfly clasps on my baby diamond stud earrings which I wear daily. I have 3 studs in my left ear & 5 studs in my right. These are much more secure, safer & more comfortable than the butterflies. With these, I don't worry about losing my studs...ever!
" Just the right thing"
Many times females loose the backs to their earring.I used these clutches on a pair of earrings(screw on posts) to keep from looseing them after the backs came off several times.This is a good product to have around as a back up or replacement.This material causes them to stay on and in place. No lost earrings! The only problem is they're very small and might slip out of your fingers but that's okay,they are worth having. Very useful in preventing earring loss. Great! Excatly what I was looking for! Work like a charm to keep wire earrings on. Much better than the usual metal backs. they fit better and hold better. This attachment to your earrings will without doubt prevent earring loss. Very easy to install. I'm always losing earring backs, especially the ones for my French wire earrings. These are great to have around to replace the lost ones. They fit all my earrings and are very dependable! These are a great value! Thank you! I love these earring backs, they hold my earrings in place better than any others I have used. Great product. I've often lost dangle earrings because they slip out of my ear easily because they don't have a back to prevent it. Now, I can use these fasteners on the wire behind my ear, and don't lose earrings. They're clear and not noticable, too. The only problems I have with them is that they are difficult to locate if you drop one, and they can be difficult to fasten to the earring sometimes. I have bought these before,I love them!! They keep me from loosing my ear rings! Finally, I won't lose an earring without noticing it. these are invisible and comfortable. No more lost wire earrings! These backings are transparent so don't show up at all when wearing. They keep wire earrings securely in place exactly as they are supposed to. Very comfortable. Well worth the money. I have nearly lost several French hook earrings because they would slip off my ear without my knowledge. I have been unable to find French earring clutches to secure my earring. These are terrific! I don't even know they are attached to the hooks, but I do know that I don't lose any more earrings. These are great. Use them all the time. No more lost wire earrings. I have lost several earrings because I did not have a backing for my wire earrings. Now, no problem, no more lost earrings. I even bought a set for my granddaughters who are teenagers so they won't lose an earring too. This is an earring saving product! This is a true earring savior! I can't tell you how many earrings are now onsies versus pairs due to the earrings falling off my ears and disappearing. These clutches really lock the earrings in place so that you will never lose them again. I use the rubber backs for my wire earrings. They are easy to slip on. Thai was the only place I could find these. I have ordered these several times. The openings may stretch a little after repeated use over a long time making them slip more easily, but at such a low cost, ordering more every few years is hardly a problem. Prior to using these I lost a valuable and sentimental earring; since using these no earrings have slipped or been lost. I love these. They are easy to use and since using, I have never lost another ear ring. Great product. These backing are very easy to put on. The ridges make it easier for older fingers to hold. After losing an earring or two, when I saw these, I knew they would work. Really inexpensive save for some expensive earrings! I should have bought it before the time in did I wouldn't have lost my expenive earring. I'm very very satisfy.I would recommend it to anybody before you lose your earring it's wearth it. I ordered these rubber earring backs because I lost one of my favorite earrings when the fish hook came out of my ear. I didn't think I needed a back on a fish hook, but I don't wear earrings without them anymore! These many in a package is a real bargain! These are a life saver, I have lost more hook earrings and expensive ones at that, when they come out of my ear . these backs keep them on if they catch on a sweather or what ever everyone should have some of these. Found the cluthes to be very comfortable and asuring that I will not have to worry about loosing any more earrings. Great replacement for easily lost items. Needed replacement part for jewelry. Delighted to find such a satisfactory product. I have some wire pierced earrings without anything to hold them in my earlobes - lost 1 out of quite a few pairs. These work just exactly as I needed - holding my wire earrings to the back of my lobe so that nothing causes them to fall out. I am happy that I will not have anymore 'onezies' earrnings!!!!!!!!!!!!!! All pairs!!!!! Husband bought me 3 pair of earrings for Christmas and none had backs so now I'm all set! I have lost earings in the past and wanted to find something that could be concealed. I am very happy with these. I can now wear some of my favorites with no concerns. These are great to stop losing earrings w/open wires! The product is fine for every day use.It keeps the earring securly in place. These earring clutches work exactly as they were designed. They work perfectly. They are easy to put on. They are practical, comfortable. You can wear them any where and any time. There is no special time to wear them. Not found at retail! A Treasure!! What a surprise to find in your catalogue. I could not find in retail,not even Charming Charlies. I bought several packets. earrings. Now I am able to replace them and not need to worry about my earrings falling out. These have saved some very expensive, some rare one of a kind earrings. These prevent the earring wires from slipping out of my ears, and when placed on the end of the wire keep the wire from poking my neck. Fits perfectly on the back of French earrings or even on posts that have lost their backings. Wire pierced earrings are easy to slip from your ear without your knowledge. I have had it happen with a favorite pair. Since I found these clutches, I know my earrings are secure. They are clear, so not unsightly. Will not lose anymore earrings now. Nice size. Easy to use. If you're an earring junkie like me, you can't have too many of these! Now I don't lose my earrings! I have lost so many earrings because they didn't come with backings. Now I don't have to worry! Very useful at keeping earings in place. I always use these backs on all my earrings or else I would have lost many more earrings. I love these backs. No more lost earrings. I have lost many earrings. With the backs, no more lost earrings. They are clear and. Hard to see when used. Great product. I can wear my earrings without having to check if I still have them on. I have long hair and pull it back, put it up, etc. I have had earrings fall out of my earring hole. I now have a lot of these backings to cover every pair! Earwire clutches have only one purpose, to keep French wires from slipping back through your ears. This they do. This is a great product,never lose an earring again! These are easy to use, they are small,you need to line them up with the hole,then pushthis is the second time I bought them,you can trust them,you will not lose an earring while wearing these rubber backs. I can never keep fish-hook earrings in my ears. Until now. I have these on every pair I own, and enjoy wearing my earrings again without fear of losing one before I get to my appointment. I always threw these away. Now I realize how useful they are. I no longer worry about losing an earring due to catching on a collar, a hug etc. I've bought many sets of these over the years, and they have paid for themselves in preventing me from losing any of my favorite wire-style earrings, which could otherwise have slipped forward and fallen out without me realizing it (a lesson sadly learned from experience). I always include a pair with any earrings I give as gifts to friends, too. Keeps me from loosing earrings. Awesome! Keeps me from loosing earrings. use this on several pairs of earrings that I had lost the cuff to. I have had trouble finding these. They are great replacements for the ones that get lost. I feel very secure wearing my earring now. Will not go out without them. I was glad to find this product . I love these things. Sometimes earrings will come with something similar to keep them from coming off the card, but if you make your own earrings or buy them from a jewelry shop, you definitely need these to keep your earrings in your ears. I've lost a couple earrings and have actually resorted to cutting off a pencil eraser and using it to hold an earring on. These are much nicer, easy to use, and wonderful insurance against breaking up a nice pair of earrings by losing one. Highly recommended! Great item to have on hand that keep your earrings in place. Some pierced earrings do not have a back so earrings fall off. This keeps you from losing your earrings, not leaving you with only one. These make my life easier. Great! I have started replacing all my earring backs with this product. I never have to worry that my earring will fall off. Not all earrings come with backs that keep your earrings in place. Buy these and substitute or replace and you never have to worry about losing your earrings. I also ordered item 315271 (bullet ear backs)which is similar and they were much to big and showed on ears. These are much better and do not show on your ears. Both same price. Great. Affordable. Works perfectly for all earrings. Since I began using these simple little clutches when wearing french wire earrings, I have not spent one second looking anywhere except my ears for my earrings. These are the best earwire guards that I have found. They do not get hard, like some others I've tried. They do not slip and are easily hidden behind the earlobe. It really saves on having to replace earrings. This items keeps me from losing a pair of earrings. They hold the earring in place perfectly. I have bought these in the past. These keep French hook earrings from falling out and getting lost. I use these all the time. If I happen to drop one, it's pretty hard to find. So I have to replenish my supply from time to time. I purchased these rubber ear wire clutches because I kept losing my earring backs. These little rubber clutches work on post earrings as well as wire earrings. I love them! don't know how I lived without them! These are a must have. I carry an extra pair in my purse just incase a friend might need one. These clips are exactly as advertised. This product is excellent. I use them with all of my pierced earrings. They are very comfortable. I prefer them because they are clear, not silver or gold. I purchased them to replace some lost earring clutches, but now I use them for all of my earrings. I love these. Not too big not too little, holds the earrings in place, and easy to grasp and use. Will buy more. Have you ever lost a fishhook earring? Well I did because I didn't have a backing to put on the end of the hook. That will NEVER happen to me again with these little stoppers. I had just bought some earrings and lost one the first time I wore them so I had to re-buy them and that's costly. Live and learn. I use it with all my earrings and everywhere I go. I can't be without my earrings. I have lost an earring in the past as it slipped out of my ear. Since then I've been using these rubber earring backs on wire posts to ensure this never happens again. I hate to buy French wire earrings, as I am always losing them, knocking them out with my shoulders when I shrug. These help prevent that problem. What a cheap and logical solution! These slip on the wire on the earrings to keep them from slipping out of your ears. They work very well, and the holes are just the right size to stay on but still be easy to push onto the wires and remove. These earring backs are indispensable. If I didn't have these easily slip on backs, I would loose many beautiful and expensive earrings. I can't get enough of them, and wish I had learned about Miles Kimball earlier. I seem to lose earrings because the "clutches" are too loose. These take a while to put them on the first time, but they fit snugly and do the job!! These keep my long earwires from slipping off when I bend or stoop. They are comfortable and I can place anywhere on the earring I choose. The sides are grooved, so easier to hold to put on wire backing. I love the convenience of French wires, but NOT the way the earrings try to slip away. These convenient little clutches keep your earrings exactly where you want them, and no lost earrings! They hide out of sight, and are as easy to use as a regular earring back. They are great for travel, are flexible enough to fit many sizes of ear wire. I use them for all my backs now, they are so secure! Fits nice and snug, would buy again. Great product, doesn't slide off. These rubber earring backs are great when you have French Wire Earrings that don't come with their own back. With these backs you don't have to worry about losing your French wire earrings again. With the prices that are charged for earrings today, who can afford to lose any? Great for prevention of losing an earring. I have ordered sets of these a number of times over the years, and they have always worked so well on french wire earrings. They are nice and small and keep your earrings from coming out accidentally and perhaps getting lost. I've lost too many earrings. I use these every day. now I know when I go to remove my earrings there will be two. i have about four single earrings because one has slipped out of my ear. maybe when removing clothing?? Never know when it falls out. These clutches keep them secure. They are really great! These little doo-dads keep from losing hook earrings. Once gotten onto the earring, it works just fine. I feel that eventually the openings will ease open a wee bit more.. not too much though, then it'll be easier to put them on. I think I will appreciate having them as I really don't like losing earrings. Hard to find item! You had it! Thanks! Lost earring days are over! On occasions, I have been saddened to discover that one of my earrings had simply fallen out of my ear and I hadn't noticed it until later. That problem is now cured by using these earring clutches. No more lost earrings, yeah!!!! Great item to keep earrings where they belong. I have several pairs of earrings that are wire and my hair is long when moving hair away from face I have had many earrings lost from my hair getting caught in the wires. This keeps me from loosing earrings. As a backing for earrings, they are easy to use and keeps all earrings secure. I use them to keep my wire earrings from falling out. A little pricey for so few in package. They are so tiny. The most tiny I've ever seen. I have bought them elsewhere for more in a package for the same price and they were bigger. They do serve the purpose. I am a mom with two nearly-grown daughters, and we all love our earrings. 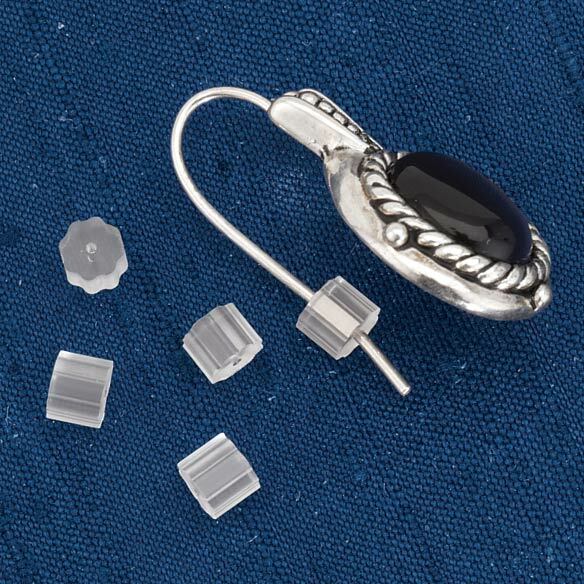 These backs help us to avoid losing our earrings while enjoying those comfortable Euro wires. I only wish they were available in larger packages, say 30 or 40 backs to a package, as we use them all the time and, let's face it, they're small and easy to lose. Worth every penny, though. now I will never worry about my errings slipping out and not knowing it. I can say how many I've lost. This keeps them in place. I like using on ear rings while wearing to keep them safe from loss. It would be nice to have a larger quantity in the package for the price that is charged. I am always losing the keepers. These are clear and may be difficult to see if I drop on carpet, but I like them. French wires have a habit of slipping out & I was always losing one of my earrings. For a small price, these clutches keep my earrings in place, saving my money and my favorite jewelry. saves your earrings that you would probably loose otherwise. I have bought these several times for my kid's. They come in handy when the ones you get with earrings fall off or get lost. Now I won't lose one earring with this safeguard on the back. All wire earrings should come with these. Helpful, stops me from losing valuable earrings. No more lost French wire earrings. out of ear lobe. They work well. They are too small and hard to grasp and so are very difficult to put into place and also to remove. Colorless, so all but impossible to find if dropped. with their limitations noted here. After losing an earring I loved, I decided to get these "guards" to make sure that neve happened sgain. They work! useful for missing back to earrings. Exactly what I needed for my earrings! They work perfect. My Earrings stayed in place and they were not too large to be noticeable. These earring backs work on almost all sizes of earring posts. They seem to be non-allergic & stay put(don't slide). I LOVE them! I bought these for a pair of earrings which have 3 cubic zirconia on the front. These stones pull the earrings down, and they look bad because the ear wire shows instead of the stones. I put these clutches on the ear wire before hooking them, and THEY WORK. They are a little hard to thread; that's why I gave 4 stars. Don't lose earrings by using clutches! I needed clutches so that I would not lose my earrings.....they fit perfectly and there's no worry about losing earrings. IIiiI was so happy to see these . Miles kimball sells the most practical things at a reasonable price.I looked everywhere for quality earring cluthes. I have looked at many stores locally and have been unable to find the French wire clutches. Most of them didn't know what I was talking about. Thank you for offering them. Will gladly purchase again when needed. Extras travel well (purse/suitcase) in orig. bag. Will use for Christmas stocking stuffers for daughters/granddaughters. Hard to find if dropped but size is appropriate for what they were designed. This product is useful. You know how you lose the backs of earrings all the time...well now you can store extras in your jewelry box. I have so many earrings with no mates, because the hooks have slipped out of my ear. These prevent that from happening. They may be stiff at first, so I thread the end of the hook through the hole in the clutch, turning gently so as not to bend the wire hook. I thread the clutch all the way onto the hook, then gently remove it. This "loosens" the clutch so it goes on the hook easier when it is in the ear. A few earrings have hooks that are too wide to work with these. I am always losing these wire earing clutches from the earings I buy. This is great to have a reserve to have on hand. priced well; I am always losing them! You can never have enough of these and they are priced well. I purchased these earring backs because I have a daughter who is super-sensitive to costume jewelry and the backs of her earrings always make her ears infected. I figured it wouldn't hurt to give them a try. She has had no reaction since we started using them. She is excited that she can now use her earrings and I am satisfied as well. I will be purchasing more of these in the future! It does what it needs to! My co-workers are always losing their earrings and I tell them they need to purchase these. It's a simple tool and it will save them a lot of heartache when they can't find their favorite pair of earrings! Great for wire back earrings. Keeps the earrings from falling out. The French wire earring clutches are so easy to use. They fit every pair of French wires that I own. I put the small plastic clutches on most of my earring wires, and I feel assured that my earrings will stay put, and not work their way of my ears. I have peace of mind, especially when wearing expensive earrings. Great for keeping my earrings in place but a little difficult for me to put them on. My fingers are not as nimble as they were a few years ago. I am 75. I use these with a lot of earrings and give some of them . very useful even for small girls. This product will save you from losing those French wire earrings. wire earrings do not come with the backing. I have to have these clutches but some of the holes are so small and tight I make my ear sore trying to fit them on my ear. I have lost a whole set of these little things because my hands are so poor. Due to the size these would be difficult to use for people with arthritis or grasping limitations. Also, the hole was quite small and needed to be expanded to use with wire earings. I consider these essential to keep from losing earrings and to hold them in place. NOT HAPPY WITH THE QUANITY! I keep losing these, so another supply was needed. the holes in these clutches were very small, I had a hard time getting them on some of my wires. I had to make the holes bigger. The clutch is too small slips from finger easily. [...] The holes are too small to get hoop earrings in and it's a struggle to take them on and off. I'm assuming they will losen up with use, but they are really too tight. It looks bigger in the photo. I have lost backings for hook earrings and I don't want to lose the earring. These should be a little bigger. They are so little I can't grasp them well. These were bigger and bulkier than ones I needed; I am disappointed I got two sets of them as i really can't use them. I wanted the smaller, more flexible secures that I have gotten on pairs or earrings at stores. Now I am back to square one to hunt for some, and out $. They are fine; however, as I looked at the pkg, I thought it was way too much money for these few earring clutches. I doubt if I will use these because they are very difficult to use. Too small for the wires. I was expecting something better. material is harder then I would have liked. Still usable. I read the reviews before ordering these and and they were kind of split 50/50 on being useful and being too small. Don't waste your money by ordering these. They are tiny, tiny. They don't even fit on the french wires. You should remove them from your catalog before you have too many more dissatisfied customers or state how small they are. In the picture, they look like a normal size. Very disappointed in them. Too tight to get on wire! I tried these on SEVERAL of my french wire earrings. You can't get them on the wire!! The hole in them is much too small. I have bent the french wire trying to get these on them...and can't. I have lost a few expensive gold earrings due to not wearing backs like these on the wire to keep my earring from coming off. They need to improve these with a larger punched hole in them. There are only twelve pieces total--[...] Description should read - SET of SIX, Not twelve. Disappointed, felt misled & like the item was misrepresented. I Sent it back--Can get more of the product for the same cost elsewhere. Too small in size, hard to handle...great for little girls earring backs. I was really looking forward to having something to secure my wire earrings. Unfortunately these clasps are almost impossible to get on the earrings, so are pretty useless. The holes were too small for the earring post or wires. Will not be able to use so will just throw away! The holes in these clutches are so small that I could not get them on the earrings - I've had other very similar brands in the past which fit just right. These seem to be a very bad imitation. Like other reviewers I found the holes in the clutch way to small. I actually bent the wire on a pair of earrings trying to get the clutch on. I placed them on a safety pin to stretch the holes. I can use them now. Wire gets bent trying tp put in too small hole. i was going to use them for my hanging earrings but could not get the wires thru the plastic. These clutches do not come off wire. They work very well and are inexpensive. So as not to lose my very expensive earrings...comfort. They were needed to replace lost ones. To secure a pair of earrings with French wires. I have a lot of wire earrings and this earring clutches will secure them. I like to always have a supply of these on hand. Kept losing wire earrings. The "clutches" keep the earrings from slipping off. Need to fill in my stock. Lose them a lot. I needed more of these backs for the earings I have. Always losing the backs for my pierced earrings and then the earring comes off without my knowing it. I lost a couple of very nice earrings because of wearing them without the backs. Use these often when traveling so I do not loose my favorite earrings. Have been looking for these earring backings everywhere. So glad I've found them. Got new earrings for Christmas and want to make sure I don't lose them. Easier to put on stem and they hold just as well. They keep French earrings from falling forward. I have lost some nice earrings and these will keep them from coming off. I have several pair of earrings that I use these for. So as not to loose my earrings. love these. keeps me from losing earrings. Good on long wires. Use them all the time. Love them. I am constantly in need of these earring backs and I have used them before and they are great in keeping you from losing your earrings. These are the best kind. good to put on earrings that don't come with backings. I don't lose earrings like I use to.